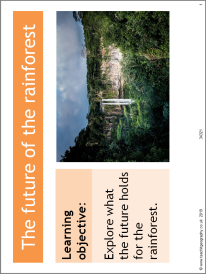 A resource looking at the issues in tropical rainforests. Students consider the causes of deforestation, the impacts and what we can do locally and globally to stop deforestation. This knowledge is gathered using a card sort activity and discussion.